Description: Not in the way youd expect. 30T sits at the ex DLW station waiting for a crew, while a Broome Transit bus crosses overhead on Chenango St. Its either a 28-Robinson St or 40-Chenango St; both use Chenango out of downtown, with the 28 turning onto Robinson to head to the end of the line at the Binghamton Psych Center. The 28 was good for seeing the action at Bevier St, since it also did a loop up Broad Av in both directions. Many a morning I watched NS 206 while on that run. The bus is one of the 23 Orion 6 coaches acquired by BC Transit in 2000. Description: 30T waits for a new crew at the ex DLW station in binghamton behind a mix of CN and IC power. The tracks in the foreground were set out tracks use by DLW for sleepers and mail cars. They most recently held cars and an E 8 for the Susquehanna Valley Chapter NRHS. Description: CN train 241 blast north! Description: CN 395 heads west past Durand Union Station, after working the yard in Flint. Description: With less than an hour to go to get to Battle Creek, CN 395 highballs through East Lansing, passing Harrison road. Title: CN Above Second St. 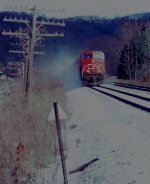 Description: CN engine # 5721 passes above Second St with a mixed freight. Description: CN engines # 2503 & # 5721 pass on by with a mixed freight on a sunny spring day.